Earthen bank at the Northern end of the North lagoon which has three flow control regulators (see below). 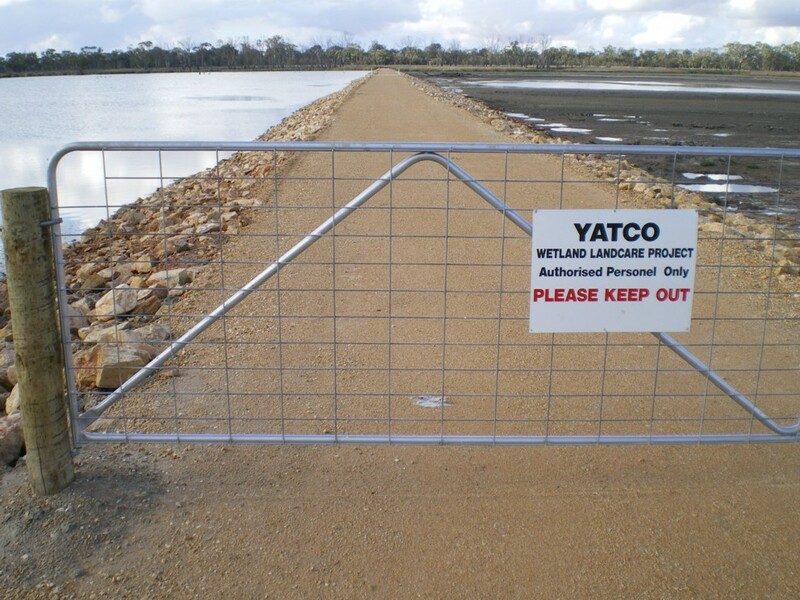 In late 2007-early 2008, as part of South Australia’s Drought Contingency measures, an earthen bank was installed at the northern end of Yatco Lagoon to allow for its disconnection from the River Murray (see Plate 16 below, and page 7 also). At the same time regulators were installed in the causeway between the North and South lagoons and also where the North lagoon joins middle creek. During the following, almost 15 months, the wetland was allowed to dry out for the first time since the installation of Lock and Weir 3 in 1925. On 18 March 2009, it was refilled back to pool level. 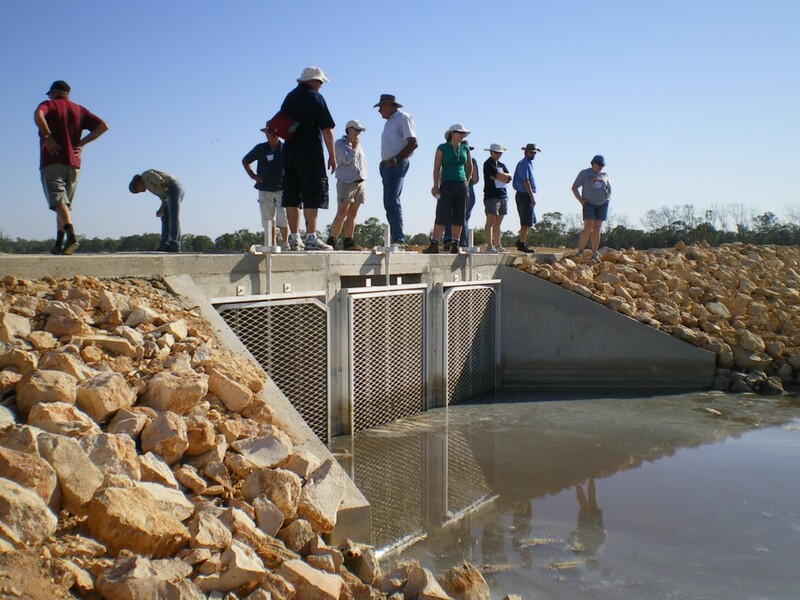 Implicit in being able to operate this hydrological plan for the wetland is that alternative water supply arrangements are in place for the irrigators and domestic users of water from the site. 2. Through managed drying and re-wetting events, improve water quality in Yatco Lagoon. 5. Increased abundance of mosquitoes and midges. Because of these risks, this Hydrological Operational Plan is deliberately cautious, and incremental, so that monitoring can advise if progressing to a more extensive drying of the system in sequential years is a wise course to follow. If this monitoring begins to show unacceptable impacts from the re-introduction of variable water levels, then adaptive management-based responses will be introduced. 1. Earthen bank at the northern end of the North Lagoon. 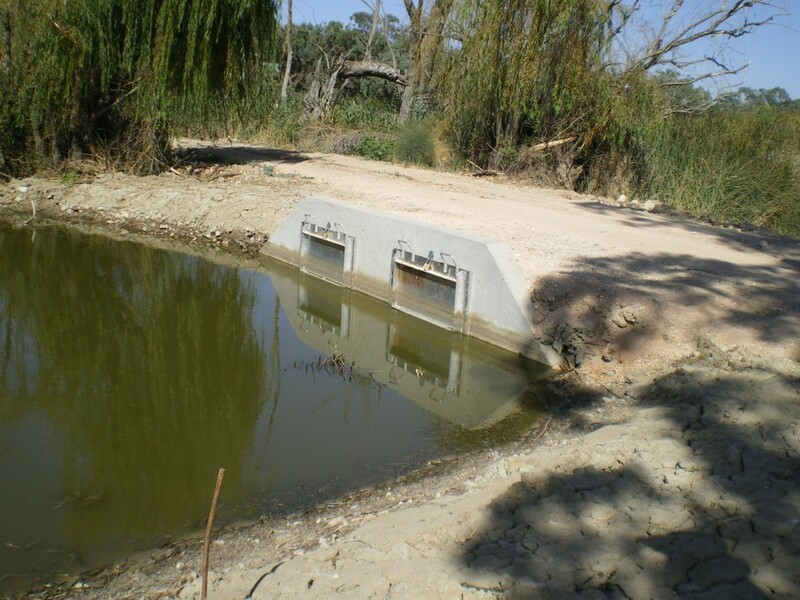 This currently has three box culverts located together near the centre of the structure, and fitted with carp screens. 2. Triple pipe culverts with regulators at the southern end of the North Lagoon, where the North Lagoon connects with Middle Creek. 3. Pipe culvert with regulator from the irrigation channel into South Lagoon. 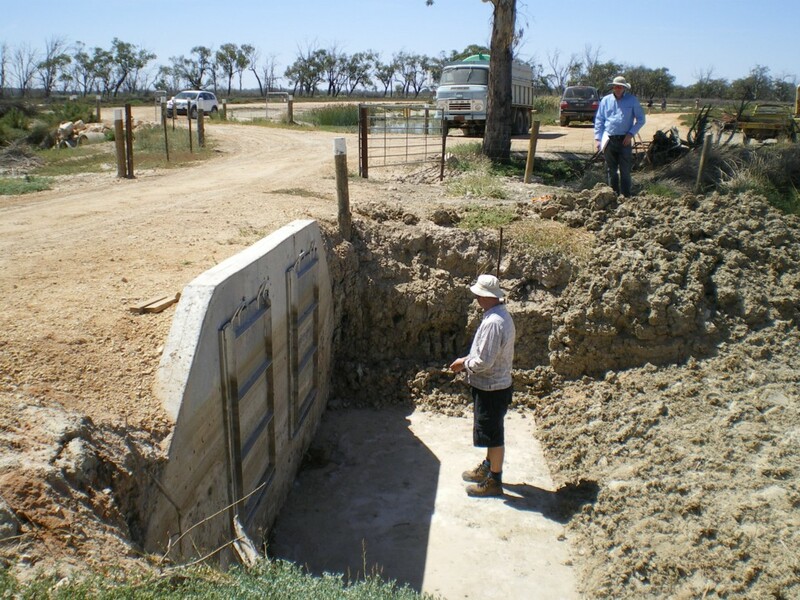 This channel is to be de-commissioned once the necessary infrastructure is in place to allow the surrounding irrigators to source their water direct from the River Murray, and also to vent irrigation disposal water back to the river. 4. 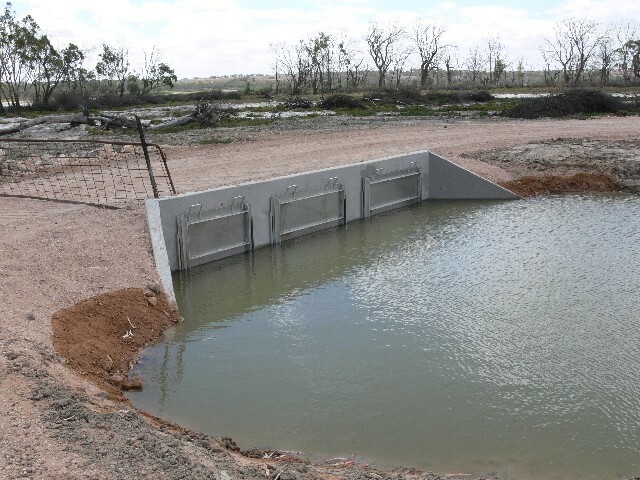 Double pipe culvert with regulators connecting between North and South lagoons through the ‘causeway’. February 2009 - wetland dry for the first time since 1925. Regulator installed at the Causeway between the North and South Lagoons (above) - when dry and (below) - when wet. Regulator installed between Middle Creek and the North Lagoon, near the Causeway linking the North and South Lagoons. 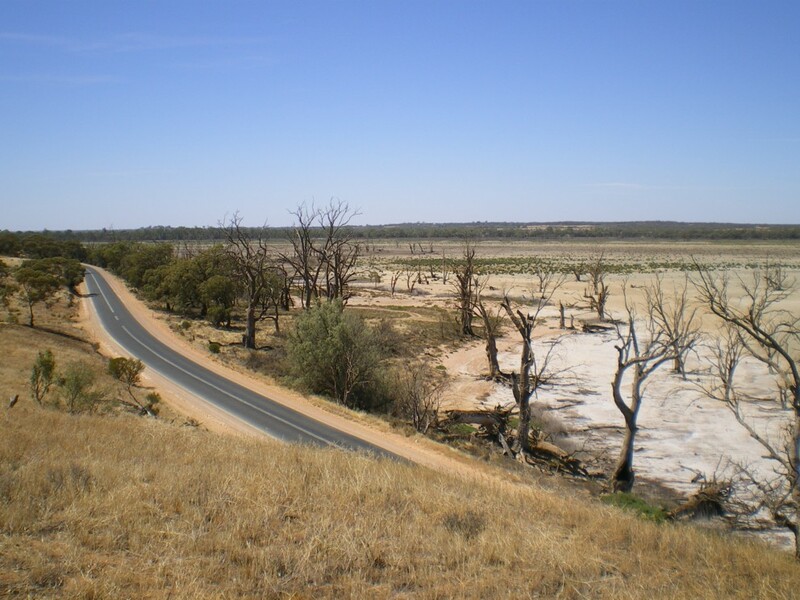 "through reintroducing drying phases to the wetland, this would not only help reinvigorate the ecology of the system but it would also generate water savings that could be provided to the River Murray, thus contributing to the recovery of the overall health of this ‘parent’ waterbody which is so vital for seeing a broader range of biodiversity re-colonise Yatco wetland. The opportunity exists here for a significant win-win outcome." And...."The significant other product from these re-arrangements is the water savings (for the benefit of the River Murray’s health) that come from reduced evaporative losses across the wetland during its dry times, and in the former open irrigation channel." For the authoritative advice on projected water savings - see the Technical Report by Dr Chris Gippel (click here).